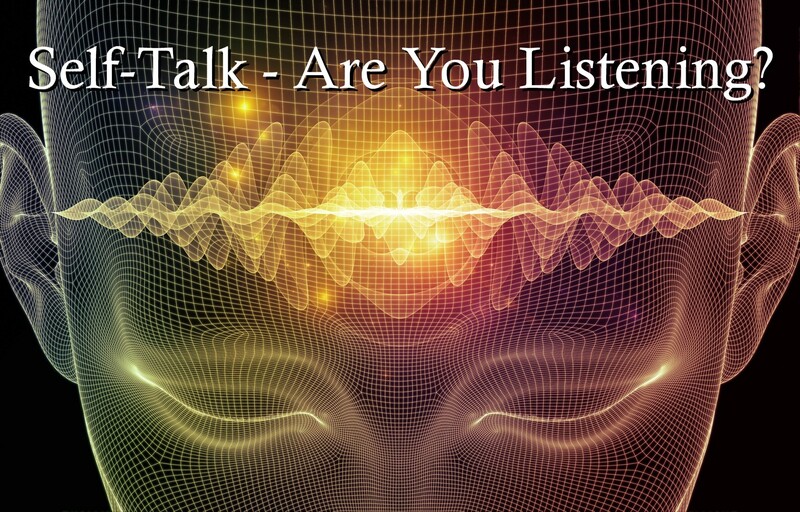 Self-Talk – Are You Listening? When you feed your brain ideas, questions, affirmations, ideologies, and thoughts, you’re establishing the mental building blocks your mind uses to create your reality. So how do we balance the angel and devil on our shoulders? We do it every day, all day long—self-talk, that private conversation we have with ourselves. It’s going on in our heads around the clock. And occasionally, when our inner voice is determined to be heard, we actually say what we’re thinking, out loud. Sometimes the chat we have with ourselves takes on the form of a rehearsal . . .
“No, sorry, I’m not available. You’ll have to find someone else.” That’s what I should have said. I have to stop being such a pushover . . .
Other times, we’re busy processing, reviewing what we said versus what we were thinking, or replaying what we heard someone else say, trying to derive the real meaning. The internal conversations in our minds are an inherent part of the way we communicate, helping us to better understand our life and those we share it with. At times, it’s a kind of guiding voice, attempting to translate the not-so-obvious and often subtle differences between the world as it exists, and the way we personally perceive it. So how much control do we have over our own self-talk? With a little practice, we can motivate ourselves to take positive actions, while strengthening our resolve to avoid choices that can result in negative outcomes. Sound like hocus-pocus mind control or psychological mumbo-jumbo? It isn’t. In fact, that little inner voice can become your strongest ally in helping you lose weight, eat healthy, get in shape, and a list of other desirable goals you want to achieve in your life. Let’s start with the most basic decisions we can make when it comes to self-talk. When we realize we’re having a conversation with ourselves, our choices are to ignore it, influence it, or confront it as misrepresentations or outright lies. The real tip-off is knowing when it’s time to take control and stand up for yourself. When you hear the priorities you’ve set being “talked down” by rationalizations that give you an excuse to cheat, ignore your goals, or be irresponsible, your inner voice is attempting to deceive you, even trick you into doing something contrary to what you’ve already decided is the best choice in the long-term. In all these cases, this gal was trying to give herself permission to behave in a way she knew would sabotage her personal goals. By using a logical argument you know is both the truth and makes you feel good about yourself. “The guy in the office does it, so it must be okay for me.” Does that sound like the truth? Would going along with that logic make you feel good about yourself? “I know the store brand contains high fructose corn syrup, but it’s cheaper, so I can get more of it.” If you buy the cheaper brand, will the product serve the best interests of your health? Or will it actually cost you more long-term in the form of health issues and even medical bills? If you answer truthfully and buy the store brand anyway, how will you feel about yourself? “I don’t have time to exercise today. I’ll do more on the weekend to make up for it.” Is this a practical alternative for your body? Will missing today’s workout and trying to do twice as much next time help or harm you? Answer truthfully, then ask yourself how you’ll feel if you skip your workout. I like to think of self-talk as “brain food.” When you feed your brain ideas, questions, affirmations, ideologies, thoughts, mantras, etc., you’re establishing the mental building blocks your mind uses to create your reality. We all know how feeding our bodies with healthy food is an important, vital part to maintaining a positive lifestyle while helping to increase our longevity. In the same way, feeding our minds with positive reinforcement enhances our ability to be strong, disciplined, and make decisions that serve our physical body and mental vitality. 2. Review your short and long-term health and life goals every morning. This process of “reactivating” these aspirations at the beginning of your day helps keep you on track, and gives them a greater sense of priority in your life—which is the key to making them come true. 3. Meditate. The ability to be alone with your thoughts may be one of the most important skills you can learn as you create an improved and more positive version of yourself. Be realistic with your time and a little bit selfish in practicing this calming and inspiring technique. Ideally, begin your day with meditation, allowing your mind to open and focus on your intentions. If you have an erratic schedule, start by finding a few minutes during the day to sit calmly, close your eyes, and breathe deeply. 4. Be your own cheerleader. You are the “I” in your self-talk, and you’re the only one who can grant yourself permission for your thoughts to take conversational form. You have the ability to influence the direction and outcome of those thoughts. For example, when you tell yourself, “I’m too fat and need to lose weight, but I just don’t know how,” you’re asking yourself a question, and you have the power to give yourself the answer! By acknowledging your desire to improve yourself, you’ve already taken the first step toward making positive changes. 5. Read or listen to positive sources of input on a daily basis. Whether it’s a blog, e-zine, your favorite author or health coach, find a source that touches and inspires you to be better, stronger, and healthier. Make notes as you read or listen. Pay attention to tips on how to improve your diet and lifestyle, and let these ideas merge with your own thoughts. Share articles with your friends and family and let them know you’re on a path of improvement, and you’re grateful for their influence in your life.